At Brentwood we take great delight in the student artwork proudly displayed in our hallways and galleries. 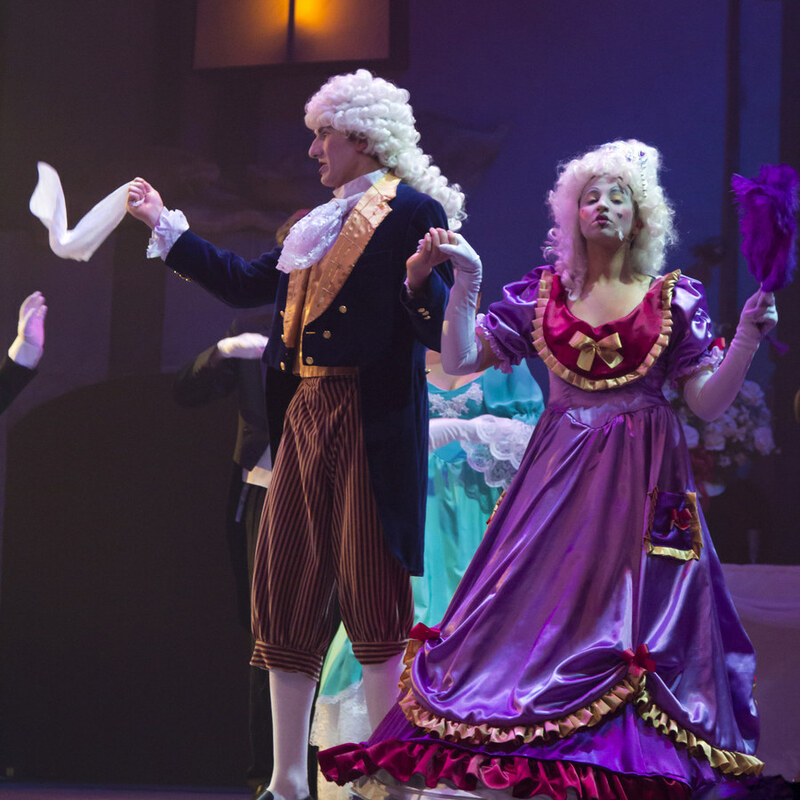 By the grace of our hands, objects of beauty, persuasion, and intrigue are created. When the rugby games have ended and the final exams are marked, our artistic creations remain, reminders of the inspiring moments found here on the shores of Mill Bay. The basics of 3D animation will be delivered to students who are interested in learning this creative field. No prior experience is required and is open to students in all grades. The complex topic of 3D animation will require students to be comfortable using technology and have the ability to remember detailed workflow patterns. Software is freely available to students; however minimum system requirements may be a barrier to working outside of the media lab. Upon completion of the course students will be able to generate a complete 3D scene with basic animations. A prerequisite for entering this program is the successful completion of the Grade 10 Beginners Traditional Photography course. This course explores advanced techniques of traditional photography including a deeper exploration of the camera's creative tools, the use of specialized films and camera accessories, studio lighting and advanced darkroom skills while working in a professional level darkroom. Challenging assignments will provide an introduction to such diverse techniques as multiple exposures, negative sandwiches, contrast control with filters, motion in a still image and hand colouring and toning. A deeper discussion of Black & White photography and its role in social change will be discussed throughout the program. A variety of assignments will introduce students to the potential of digital photography in their future occupational and educational activities. Preservation and display of photographs will be taught enabling students to participate in three school art shows. Students will need to bring their own 35mm SLR traditional (film) camera to the course or consider renting one of our beginners traditional (film) rental cameras for $150 for the course duration. There are additional costs for film and printing paper which are available from the school store. Photojournalism 10-12 is offered to students who are interested in chronicling a Brentwood school year in print and photos. Photojournalists publish fortnightly news stories about school events for the website. Students interested in this course must be able to work independently to deadlines and be willing to cover assignments outside of regular class time. Successful applicants must be able to demonstrate a superior level of written English and a proven record of meeting deadlines. Experience with publishing and an SLR digital camera are assets. During this course you will learn how to use the machine and hand tools to construct various wood projects. In term 1 and 2 you would work on assigned tasks and learn how to cut, create wood joints, sand and apply stains, waxes and other finishes to your projects. There is both a design and theory component to this course in addition to using the workshop. In term 3 you will design and work on your own personal wood project. Unless you are enrolled in Wind Ensemble, Grade 9’s will have one rotation per term in these Foundation Arts. This course will explore various elements of 3D design ( line, shape, form, texture, pattern) and use a wide range of materials to explore those elements and to develop their own design skills and personal expression. Some of the projects include forming relief and 3D cardboard structures; constructing wire sculptures; creating sculptures using elements from nature and carving soap stone. This is a very hands on course and is aimed at developing 3D construction skills in addition to understanding the concepts of 3D design and creating sculptural forms. This course will develop an awareness of the importance of oral communication and begin to build the necessary skills and confidence to speak well in public. Activities will include nonverbal communication, such as movement and body language, as well as, verbal activities such as impromptu and persuasive speeches, oral reading and an introduction to debating. Students will be encouraged to use the skills and confidence developed in Public Speaking to enhance their class presentations in other courses. This course is intended for those digital and traditional photography students doing a third year of photography and who have a strong interest in creating photographic art. The course includes the continuing exploration of the camera's creative tools, advanced darkroom (electronic and traditional) skills, hand making prints, toning and hand colouring, optional introduction to medium format photography using school cameras, and effective presentation and display of your completed photographs. To end the school year, students will stage and host an art photography exhibit of their work in a in downtown Duncan, as well as will leave the program with a university-ready portfolio of their year’s work. Grade 12 second year photography students can request to enter this program with a submission of a portfolio.This course is intended for those digital and traditional photography students doing a third year of photography and who have a strong interest in creating photographic art. The course includes the continuing exploration of the camera's creative tools, advanced darkroom (electronic and traditional) skills, hand making prints, toning and hand colouring, optional introduction to medium format photography using school cameras, and effective presentation and display of your completed photographs. This course explores many advanced techniques including: a deeper exploration of the camera's creative tools, the use of specialized films and camera accessories, studio lighting and advanced darkroom skills. Challenging assignments will provide an introduction to such diverse techniques as multiple exposures, negative sandwiches, contrast control with filters, and motion in a still image. A prerequisite for entering this program is the successful completion of the Grade 10 Beginners Traditional Photography course. This course introduces the experienced traditional student to digital photography and photo editing using Photoshop and Lightroom. The program will also provide the student with more advanced experiences including a deeper exploration of the camera's creative tools, the use of specialized camera accessories, and introduction to studio lighting. Challenging assignments will introduce students to the role and potential of digital photography in their future occupational and educational activities. Preservation and display of photographs will be taught enabling students to participate in three school art shows. Students will require a digital SLR camera, a laptop computer that can accommodate the needs of digital photo processing and a 1 terabyte hard drive to backup image files. There will be additional costs for printing paper available from the school store. The school will provide Photoshop and Lightroom for editing purposes. This course teaches hand-built and wheel-thrown pottery for students who are complete beginners and to those who have had some experience (a year or more). It is designed to teach art through the medium of clay so that elements of design are understood at the same time as the technical processes of pottery are learned. This includes building pots by hand, learning to use the wheel and glazing and firing. This course will focus on idea development, using both traditional and nontraditional three-dimensional materials. During this course students will explore ways of creating both functional forms (product design) and also sculptural forms. Students will acquire skills in a wide range of techniques and materials, including found-object manipulation, paper, cardboard, soapstone, wood construction, mold-making and casting. During this course students will explore ways of creating both functional forms (product design) and also sculptural forms using a wide range of traditional and nontraditional three-dimensional materials. Students will acquire skills in a wide range of techniques and materials, including clay, cardboard, soapstone, wood construction, mold-making and casting. In this exploratory course students will learn a wide range of techniques including wedging, pinch method, coil building, slab construction, molds, sculpture, decoration and glazing. Students will be expected to assimilate the Art Foundations in order to achieve mastery of this course. All students will review or be introduced to the Elements and Principles of Design, Historical and Contemporary Developments, and classroom Art Critiques. Personal growth will be encouraged through the development of original and individual projects. A variety of instructional methods will be used. These include consultation with individual students as they are engaged in studio projects, lectures, demonstrations, class discussions, presentations and critiques. Visual materials will include books, reproductions, and examples. 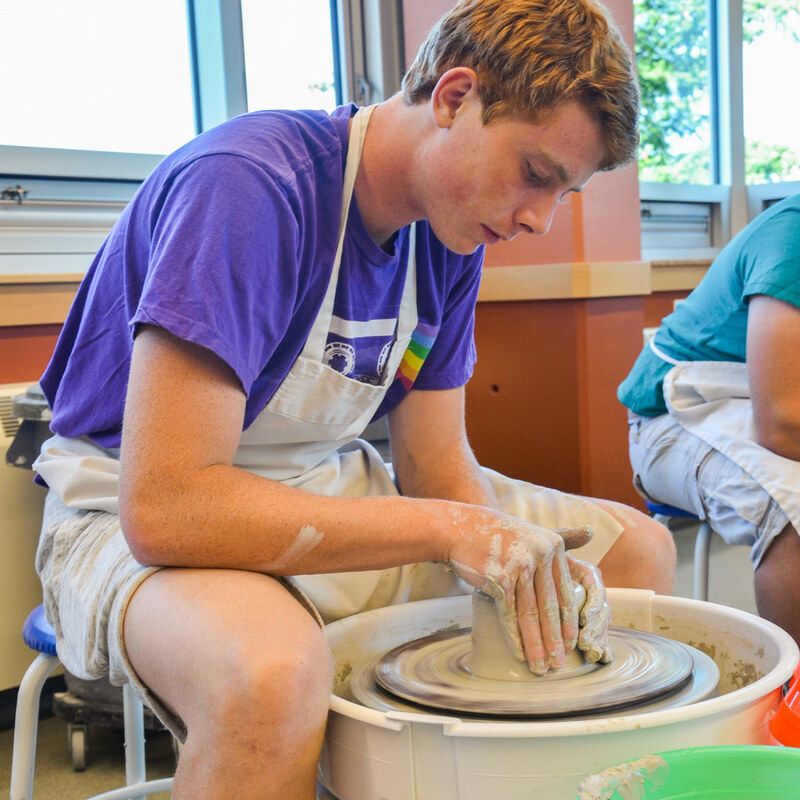 Learning about ceramics is essentially experiential and as such, students are encouraged to experiment and take risks with materials while developing personal flair in their work. The course teaches hand-built and wheel-thrown pottery for students who are complete beginners and for those who have had some experience (a year or more). It is designed to teach art through the medium of clay so that elements of design are understood at the same time as the technical processes of pottery are learned. This includes building pots by hand, learning to use the wheel and glazing and firing. This course will encourage students to see, think, and speak in the visual language of contemporary three-dimensional art. Students will concentrate on the application of three-dimensional concepts, through the direct manipulation of materials (cardboard, wood, plastic, metal, plaster, soapstone) using a broad approach to tools and processes. They will explore some of the current issues in contemporary art and culture while developing an understanding of visual language. Although this is a studio course focusing primarily on specific projects and group critiques, in an effort to develop critical thinking, a portion of time will be spent on image lectures, films, readings and discussions. Some time will also be given over to the safe and proper use of hand tools, power tools, and equipment. 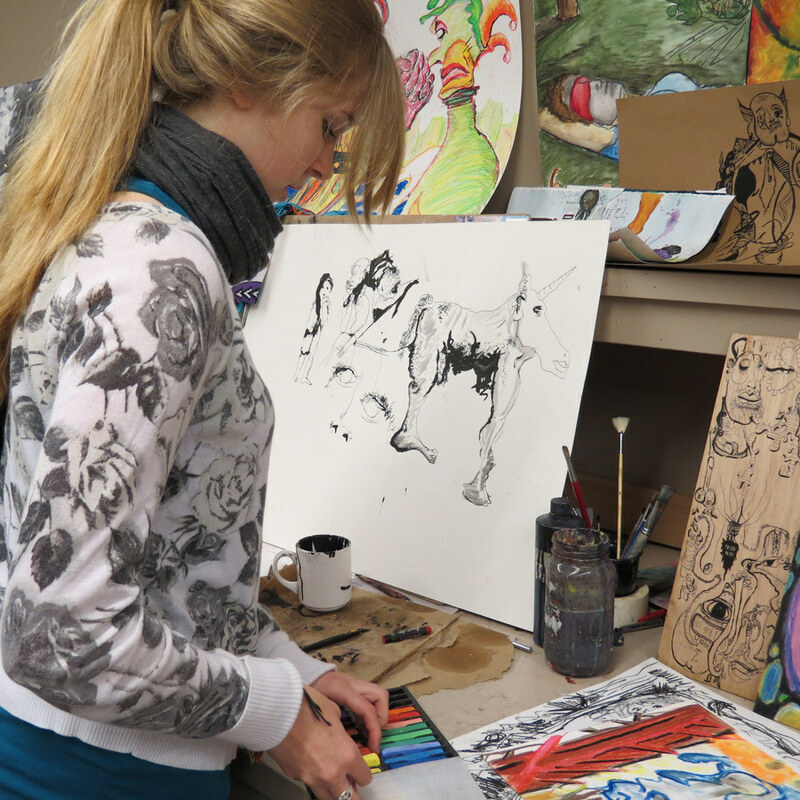 Art Foundation is course designed for beginners. Students are encouraged to develop ideas and creative/critical thinking while working on assignments that address the visual language of Art and Design. You may be introduced to painting, graphic design, photography, digital imaging and drawing. In addition, assignments will be linked to aspects of 20th century art history to allow you to place your own work within a global perspective. 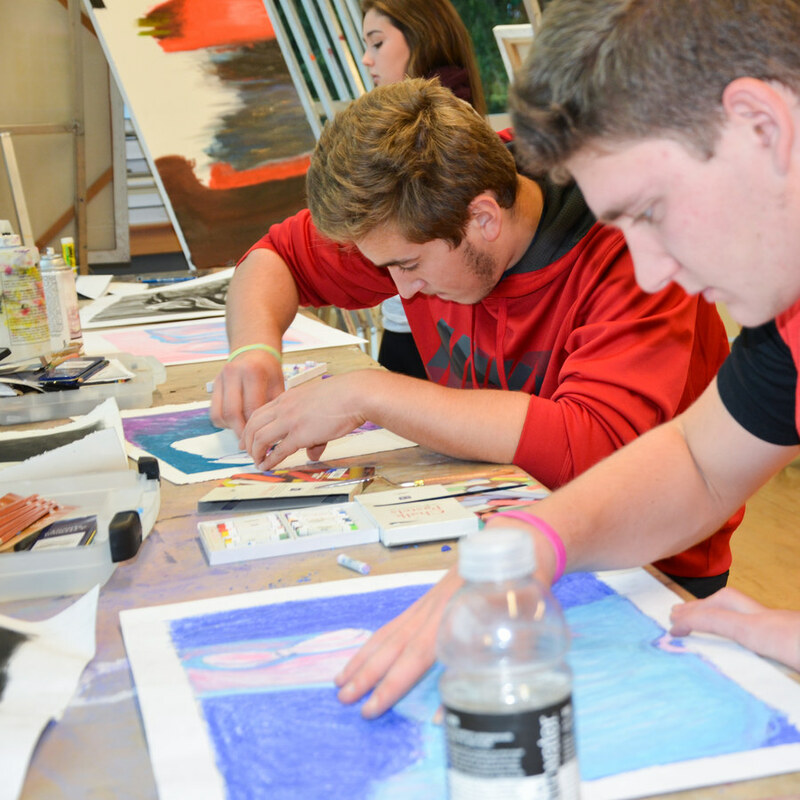 AP Studio Art is designed for students who are seriously interested in the practical experience of art. AP Studio Art is not based on a written exam; instead, students submit portfolios for evaluation at the end of the school year. The Studio Art Two-Dimensional Design portfolio is intended to address a very broad interpretation of two-dimensional design issues. Work for this portfolio involves purposeful decision-making about the elements and principles of art in an integrative way. Students are required to demonstrate proficiency in two-dimensional design using a variety of art forms. These could include (but are not limited to) design projects such as graphic design, digital imaging, collage, fabric design, illustration, painting, and printmaking. In addition, students should include a variety of approaches to representation, abstraction, and expression for the 2-D Design portfolio. This course is designed to strengthen the student's technical and observational skills. We will explore a variety of techniques, and subject matter (landscape, from life and photos), and continue to build on the fundamentals of composition, light, tone and colour. In-class demonstrations and discussions will touch upon concepts integral to the artist such as the creative process, critical thinking, and visual literacy. This course aims to enable students to explore a variety of subject matter, such as life drawing, portraiture, landscape, still life, perspective, composition and abstraction. 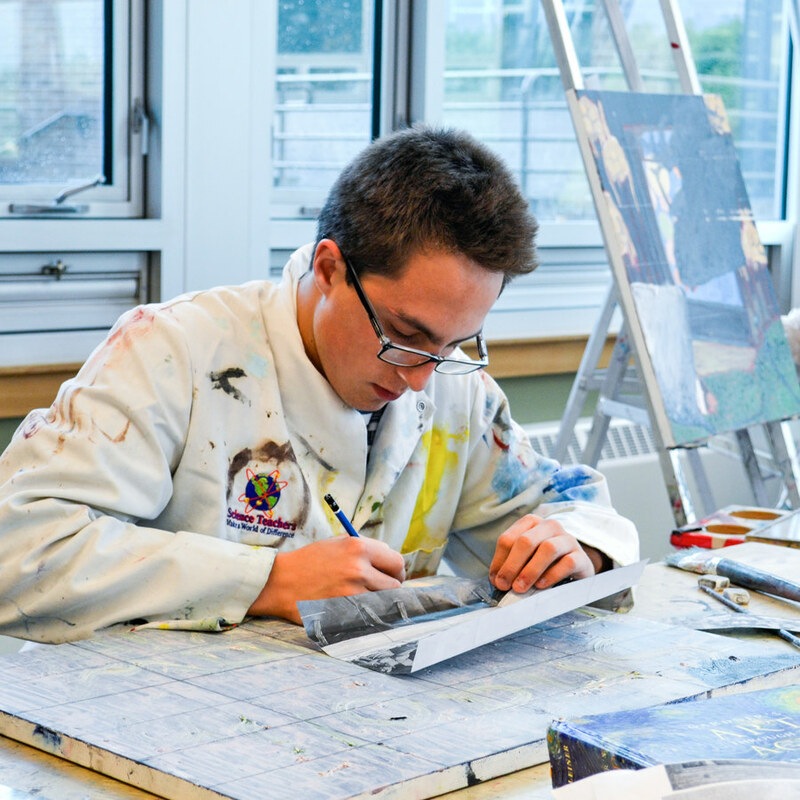 Using a range of materials and techniques, students will improve their painting and drawing skills, producing accomplished artwork, that will be displayed in the yearly exhibition. Students who wish to prepare a visual portfolio, are considering Studio Art AP, or who are seriously interested in the practical experience of art should enroll in this course. Working one-on one with the instructor, each student will develop an individualized program appropriate to the interests and goals of the student. Explorations can include all two-dimensional mediums (drawing, painting, and printmaking), as well as combinations with other mediums such as sculpture, photography, and computer graphics. 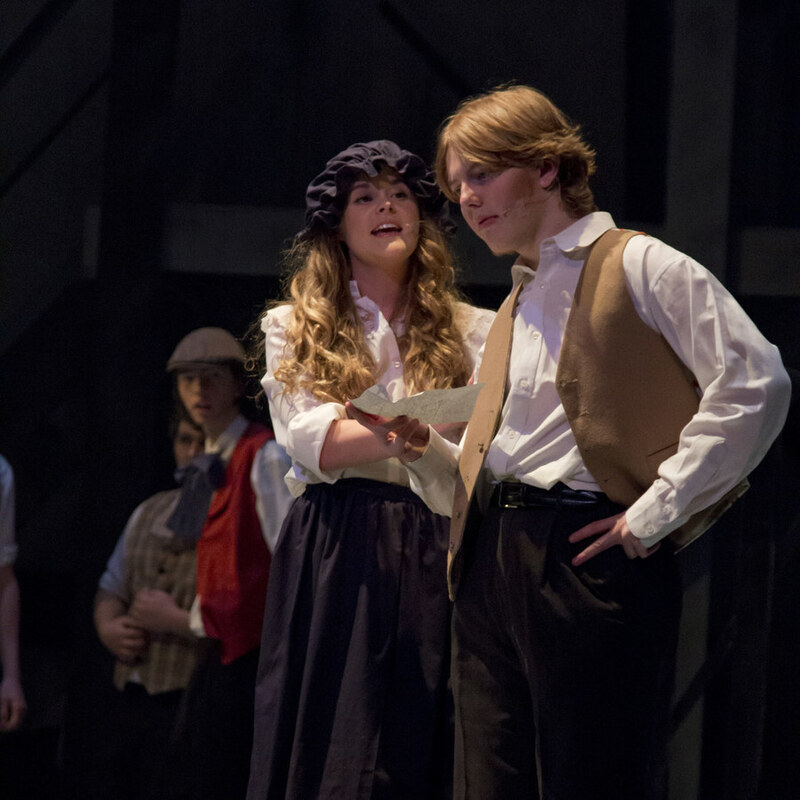 Students seeking a career in the arts or who are particularly dedicated may choose, with the instructor’s permission, to enroll in more than one block. Term 2: You will learn clay modelling techniques and how to hand build clay forms and create more abstract structures and simple freestanding sculptures. You will also learn some basic anatomy and create human and animal forms. Term 3: You will be introduced to soapstone carving and also to one piece mould making and casting techniques . Projects will include creating jewellery and small free standing carvings. Term 2: This term will focus on clay sculpting/carving techniques which will include creating human, animal forms and natural forms focusing on anatomical detail. You will also learn how to create a two piece mould and cast of your sculptures in a variety of materials. Term 3: Exploratory and self-directed unit. During this term you will create your own design brief/project idea, and then use an exploratory approach to creating your final idea using a range of materials and processes. Daniel comes to us with a wide-ranging background in teaching woodwork and 3-D sculpture. With his Bachelor of Education, with a minor in Fine Arts, from the University of Alberta, he brings to the table, a passion for all arts. He has taught Grades 1-12 arts both internationally for four years, and currently, here on Vancouver Island. In addition to woodworking and 3-D sculpture he is always reaching out to try new mediums, so he is also proficient in calligraphy, graffiti, metal work and has most recently acquired weaving looms. He enjoys inspiring students to bring their creative skills to authentic learning experiences, such as doing graphic designs for companies. He is also into physical education, having coached hockey, squash and tennis, and outdoor activities such as skiing and kayaking, he coaches the second squad and female hockey team.